One of the biggest challenges for a merchandiser or inventory planner is determining how much product needs to be distributed to each store and creating the necessary documentation to have those items picked and shipped correctly. 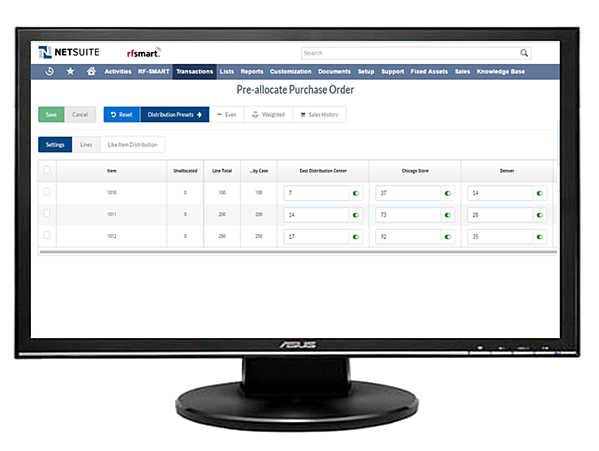 Currently, there isn’t a method in NetSuite to create a distribution of items that are purchased for retail stores and then automatically create transfer orders directly from the purchase order. That's where RF-SMART's advanced retail functions come in. Read success stories from other NetSuite Retail Customers. Ready to increase accuracy and efficiency in your warehouse?